Who doesn’t want a Pizza Joint client? Steve’s breakdown: Blaze Fast-Fire’d Pizza is the client and Shivram Vaideeswaran is the new CMO. Go for it! The number is 626-393-5880. LOS ANGELES, CA: Blaze Fast-Fire’d Pizza, the nation’s leading fast-casual artisanal pizza chain, today, announced that Shivram Vaideeswaran has joined the company as Chief Marketing Officer. Vaideeswaran is a proven restaurant marketing executive with a deep knowledge of brand equity, guest insights, and consumer-facing technology. As CMO and a key member of Blaze Pizza’s leadership team, reporting to President and Chief Executive Officer Jim Mizes, Vaideeswaran will be responsible for defining the brand voice, leading innovation and new product strategy, as well as amplifying the Blaze brand through the company’s rapidly expanding digital and loyalty platforms. Most recently, Vaideeswaran served as Vice President of Marketing for Tender Greens where he led the brand’s repositioning to modernize the brand and increase relevance to Millennial and Gen Z consumers. Previously, Vaideeswaran was at Taco Bell where he worked in various marketing roles and led new product development for almost a decade. As Head of Global Marketing for Taco Bell International, Vaideeswaran led branding, social and digital marketing, restaurant design, innovation and consumer insights for the company in 26 countries. Vaideeswaran has served as a Marketing guest lecturer at USC Marshall School of Business MBA program for over 7 years, and in 2016 he was awarded Brand Innovators’ Top 40 Brand Marketers Under 40 for the West Coast. He holds a Bachelor of Science in Marketing and Logistics from the University of Maryland, and a Master’s Degree in Integrated Marketing Communication from Northwestern University’s Medill School. Blaze Pizza is a modern day “pizza joint”, serving up artisanal pizzas that are both fast and affordable. 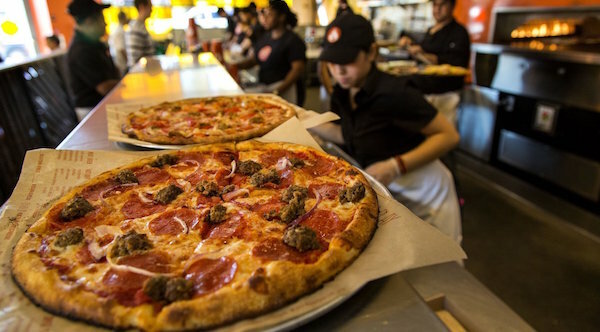 With fans lining up each day for their custom-built pizzas, freshly made salads, blood orange lemonade and s’more pies, the innovative fast-casual concept has quickly become one of the hottest restaurant chains in the country. Each Blaze Pizza restaurant features an interactive open-kitchen format that allows guests to customize one of the menu’s signature pizzas or create their own, choosing from a wide selection of fresh, “clean” ingredients — all for about $8. The generously-sized personal pizzas are then sent to a blazing hot open-flame oven — the centerpiece of the restaurant — where dedicated pizzasmiths ensure the thin-crust pies are fast-fire’d and ready to eat in just 180 seconds. Restaurants make fresh dough from scratch using a proprietary recipe developed by Executive Chef Bradford Kent (the “Pizza Whisperer”), which requires a 24-hour fermentation period to produce his signature light-as-air, crisp crust. For pizza fans with specific dietary needs, Blaze Pizza offers gluten-free dough and vegan cheese. Founded by Elise and Rick Wetzel (co-founder of Wetzel’s Pretzels), the concept is backed by founding investors that include LeBron James, Maria Shriver and Boston Red Sox co-owner Tom Werner. For more information, visit www.blazepizza.com or www.facebook.com/blazepizza.